Great value electric bass guitar package deal comes as a basic kit of a bass guitar, bass amp, lead & pics - enough to get you playing. 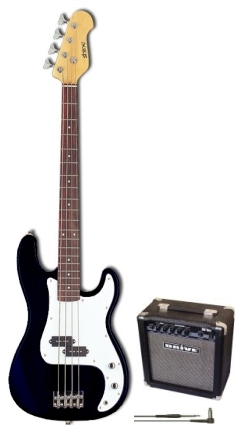 Great value electric bass guitar package deal comes with everything you'll need & more to get you started. A good quality Standard 'J' Bass available from the Stagg range. This is our range of electric bass guitars and acoustic basses from the Stagg and Artisan range.